Lupu is adamant that he did not try to steal anything, according to his lawyers. His lawyer claims that after hiding the 31 items under his stroller he was merely trying to check the price of an item which was located “behind the cashier” apparently on the way out towards the door. And that he had every intention of returning to pay for the items after checking the price of the item. In any event he has now applied for a diversionary program which would lead to the dismissal of the charges if he stays out of trouble for a period of six months. What does this incident Teach us About Shoplifting Offenses in Connecticut? 1. Rich People and People with Plenty of Money Shoplift all the Time. Often it is a crime that results from some form of emotional stress or life trauma and is an escape from reality. After 25 years of the practice of criminal law I have seen many situations in which people who are arrested for shoplifting are very well off financially and had the means to pay for the items that they were stealing. Most people assume that shoplifting is a crime of desperation committed by poor people without the means to pay for food. This is not always the case. In many cases, I am defending middle aged professionals who have no criminal record who apparently seem to be caught in a stressful period of their life and dealing with some difficult situations which cause them to act out of character. I have seen this time and time again. It seems that when people are dealing with very difficult life situations such as deaths in the family, serious illnesses, relocation, loss of a job, divorce, etc this has an effect on their coping capacity and places them in a semi depressed state in which they often make poor decisions. I am no psychologist, however, after 25 years of defending people against shoplifting offenses I have seen this pattern over and over again. At this point when a client with a decent job comes into my office who has been accused of shoplifting the first thing I ask them is “What is going on in your life?” “Are you going through under any stressful situations?” Invariably 99% of the time there is some significant stress factor at work that is the root of the cause of this lapse of judgment and this arrest. Sadly, the fact is that very often these people who do have good jobs, who have a long history of having no problems with the law have the most to loose by now having their name, picture and facts of their arrest plastered all over the internet. 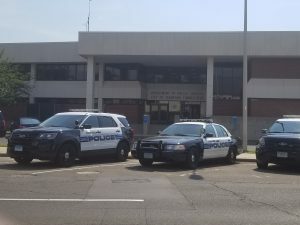 Local news organizations thrive on the publication on so called “police blotter” stories in which very minor crimes such as shoplifting are now posted on the internet. The result is that if someone later does a google search on your name very often the first thing that will come up is your shoplifting arrest. As part of my practice I work on so called “scrubbing the internet” cases where we work to force these organizations too remove these postings from the internet. Regrettably, this process can take some time and effort. If you have an arrest posting on the internet concerning shoplifting feel free to contact my office and I will explain the process of “scrubbing the internet” to have that post removed. I can be reached at (203) 515-4110. In this case the accused was alleged to have been hiding 31 items in his children’s stroller with the intention of stealing them. This is not an uncommon theme. As much as we would like to see parents teaching children good morals and values in the case of shoplifting it seems that in some cases otherwise very good and law abiding people get caught up in the thrill of the high of the escape of shoplifting and seem too forget they are involving their children in a criminal act. Under Connecticut law if you have your minor children with you when you are arrested for shoplifting in many cases you will also be charged with the felony charge of risk of injury to a minor which is a very serious offense. This arrest will trigger a call to DCF (Department of Children and Families) and an intrusive investigation by DCF into your home, parenting skills and the welfare of your children. Obviously, it is a very bad decision to commit a shoplifting offense with your minor children involved. If you have been arrested for shoplifting under these conditions the State’s Attorney is going to take a much more aggressive stance towards resolving your case. You will need the services of a Stamford criminal defense attorney to protect your rights and put a positive spin on the situation. As in the case of our friend the multi millionaire Mr. Lupu, we see that most middle aged shoplifters are in fact first time offenders who have never before been arrested for any crime. As explained earlier in this blog post there are often underlying situational stress factors that may have lead to the commission of the offense. In either event because these individuals are first time offenders they are usually eligible for diversionary programs such as the accelerated rehabilitation program. It is important however to take the application process seriously as these programs are a one shot opportunity and if the Court denies the application then you will wind up facing the possibility of having a criminal record. To read my guide on the accelerated rehabilitation program click here. I recommend that everyone who is applying for this program retain a Connecticut criminal defense attorney to represent them through the process. We have seen that there can be a variety of reasons why otherwise successful and law abiding productive members of society suddenly find themselves shoplifting. Often an over load of stress and bad news can tip someone over the edge and trigger a lapse of judgement that leads to them seeking a quick thrill or escape from reality by shoplifting from a store. In this situations as a defense counsel we have to look deeper into the cause of the behavior and look to use these factors as arguments of mitigation in an effort to have the charges dismissed or reduced. As a last resort the accelerated rehabilitation program is an option for first time offenders who have no criminal record. A collateral consequence of most local shoplifting arrests is that your name will be plastered all over thee internet. This is a horrible embarrassment and certainly can have a lasting effect on your future ability to find employment. I work on removing these horrible internet posts. Contact me if you need to have the internet “scrubbed” of your arrest.